Packaging: 1 PCS bra in a OPP bag. the packing can be adjusted according to your order. Shipping: Express, ocean shipping and air transport,all shipping way can be used to meet our need. · OEM/ODM orders are welcomed. · Variety of bra and briefs for your option. 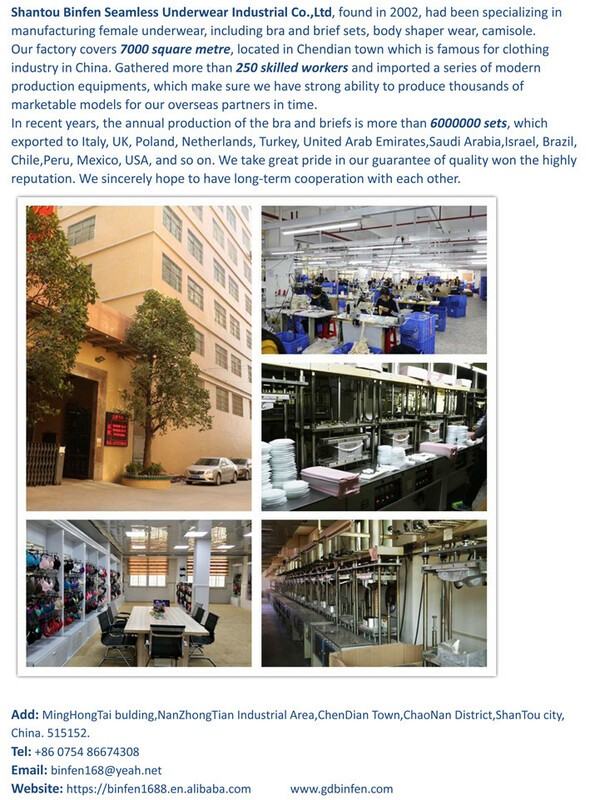 We manufacture ladies underwear, including bra, briefs, camisole and so on, more than thousands of marketable models. 2.Can you make my customized designed products? Yes, we can make the products according to customer's request, like the size, color, logo and other details. 3.?What is your principle for the samples? We can deliver common samples worth not too much if customers are willing to pay the shipping cost. If samples are made on basis of customers’ needs, we will ask for the samples fees only if we receive the order from you. Usually the MOQ is 2000-3000pcs per color per design. But our MOQ is negotiable according to your design. 5.Can you give the best price? At first, we have the ability to give the best price as we have specialized in manufacturing women underwear. Then we are willing to offer you the best price. Please feel free to contact us, We sincerely hope to have long - term cooperation with each other.